I’ve always wanted an elliptical. For about three years now, each time we’d go to the mall I’d stop by Sears to try out their display. But I doubted I’d keep at it and I didn’t want to waste money buying one. As my hubby loves to remind me, I have a penchant for collecting exercise equipment that in turn collect a fine layer of dust on them. For Mother’s Day this year, however, I finally decided I really wanted one. I’ve waited this long, maybe that’s a good sign I’ll put it to good use. So hubby gave in. And for the past few days, I’ve been faithfully logging my minutes, faithfully sweating along to the weight loss program set by the machine. And just as faithfully did my youngest one exercise on that machine. The first day we got it, he did two fifteen-minute sets. The next day, he did the same thing. I had to commend him, I could only do ten-minute sets. Today, however, as I was making dinner, I yelled out to my son that I finally did the entire thirty-minute workout. I was surprised by the sudden thud of footsteps. 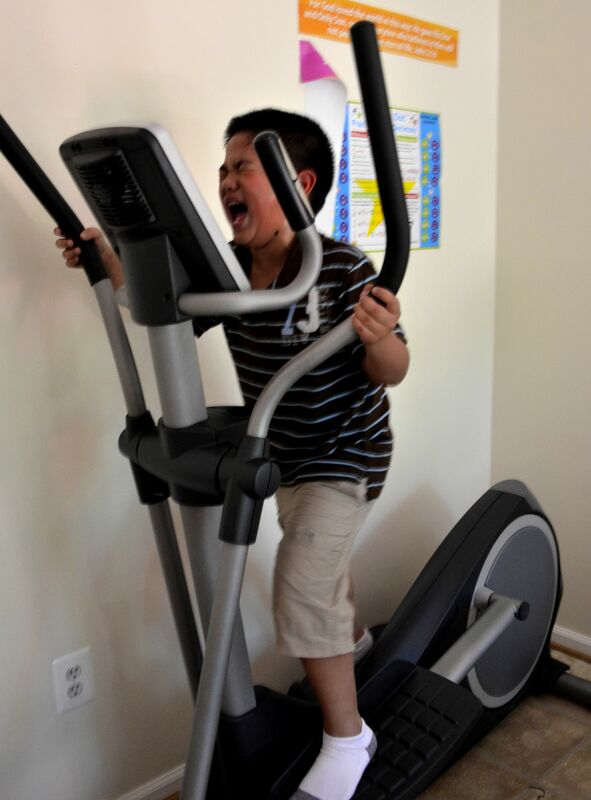 My son burst into the kitchen and without saying a word climbed on the elliptical. He started pedaling away, a set, determined look on his face. I just had to know what was going on. I let him be but kept an eye on him just in case. About fourteen minutes later, I walked over to check on him. Without thinking, I noted that he wasn’t doing the weight loss set. His face crumpled and the tears started to fall. “But Honey, you don’t have to.” It was getting harder to keep a straight face. He was sobbing hard while still pedaling away. I was weakening, I could feel the laughter bubble up inside me. I needed reinforcements. I turned around and spied my older son watching with a huge grin on his face. I begged him to go get his dad. 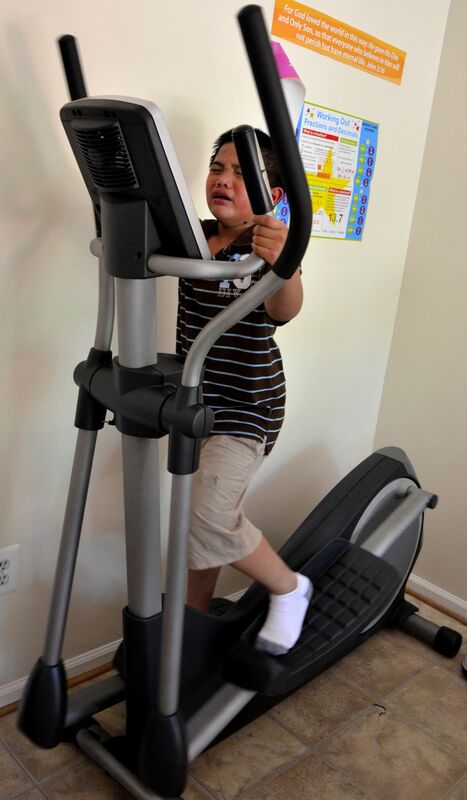 Meanwhile, the younger one has reset the elliptical. He’s starting over, and he’s mad. His daddy walks in. The boy sobs out the whole story. Shaking his head at me, the man I married offered his son a glass of cold water. He refused, claiming if he even stops for a drink, he’d have to start over. I am laughing quietly in one corner. Hubby keeps talking to his son, but the boy wouldn’t listen. So we finally let him be. Several minutes later, I check on him. He’s still at it–red-faced, sweat dripping off his chin, determination in his eyes. I look at the timer. Two more minutes! And he does it. To the last second. Still, I couldn’t resist teasing him. Wow what a great determinations to do something that he want to achived. That’s what you call power of will.